Let’s be honest: I’m a bit nesh and wear long-sleeves at the best of times. It’s been pretty nice here this week, but I’ve been mostly rocking the long-sleeve (merino) t-shirt with a short-sleeved t-shirt over the top. Long-sleeves for the summer? Makes perfect sense to me. I managed two days sat in the sun at the cricket last weekend and almost entirely avoided sunburn (the old hat, shirt and sunscreen combo serving me well). I was, however, rocking my Birkenstock sandals and now have a couple of very attractive stripes on my feet. That’s neat, that’s neat, that’s neat, that’s neat, really love those tiger feet, etc. I’m fairly sure that entering a song that has already been number one in five countries across Europe is basically cheating, but even though this is a fairly bog-standard sounding dance-track, it was head and shoulders better than anything else I saw at Eurovision. I agree that that’s not saying much in a world in which the Russian grannies came 2nd, but I did find myself singing this a couple of days later, which has to count for something, right? I know we always get screwed in the voting because we have no friends in Europe, but we can at least all agree that Englebert’s song was shite, yes? 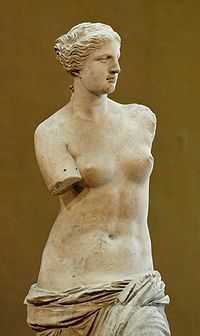 A body of Venus with arms"
Brilliant. That's surely the best reference to a classical sculpture EVAH. Surging, self-pitying classic. No, no. You go and be happy. I’ll be fine. Don’t worry about me at all. Etc. Best male singing voice in the history of the world bar no one. "Drinks a lot of liquor but he don't drink piss"
I’ve been listening to a lot of old school heavy metal and rock on my iPod running playlist for the last couple of weeks. For some reason, my Probot mp3s are a little bit louder than almost everything else I own. Somehow that feels right. I wouldn’t say I was a Presley fan, particularly, but sometimes you just can’t argue with the music. Used to good effect in the film of the same name, of course, but sometimes you can’t go wrong by going back to rock basics. This is a riff that crushes rocks (much like everything else Black Sabbath have ever recorded, now I think about it). If you can get past that – and why would you want to? – then it’s actually a pretty sad story. Tragic. Poor guy. Such ingratitude. At about 01:30 on Sunday morning, after a long, long day at the cricket, I found myself watching a documentary about the Bee Gees. Man, those guys had some tunes. I think the story I loved the most was the way that Barry Gibb discovered that he had a great falsetto voice almost by accident when singing backing vocals on a b-side. Without that chance discovery, the history of music would have been very different indeed. Their earlier, folky 60s stuff was not as ground-breaking as their disco material, but I actually really like it. “Massachusetts” is a great song. Yeah, alright, it lacks the epic swagger of the “Saturday Night Fever” stuff, but frankly, so does every other song in the history of the world. Also, Barry Gibb looks like a lion, doesn’t he? He really, really does. Brilliant band., leonine singer. That's it. It's a four day weekend here... which I fully intend to enjoy to the fullest. Well, go and see my family, anyway. Have a good weekend y'all.